Fire crews battling a wildfire that has destroyed more than 250 homes in Arizona are digging lines to protect remaining houses, broadcast towers and an important space observatory. The Aspen fire, as it is called, has forced about 1,000 people to flee since it broke out on Tuesday. 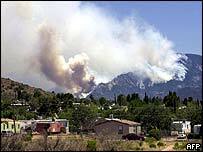 On Saturday, the fire - on Mount Lemmon - swept over a ridge of television and radio towers, fire officials said. Three broadcast transmission towers were lost. Crews have been clearing the brush around the Mount Bigelow Observatory, which was used by the US space agency to support its moon-landing Apollo programme. Sprinklers have been set up around the facility to keep the nearby vegetation wet. With high winds fanning the flames, firefighters have been looking for areas in the rugged terrain where they can create firebreaks to stop the spread of the blaze. Arizona Governor Janet Napolitano declared a state of emergency earlier this week because of the raging fire, which experts believe will take two or three weeks to contain. At present, the fire is racing through dry forests on rough terrain that is largely inaccessible to firefighting vehicles. It has burned down homes, destroyed log cabins and damaged a ski lift, ski runs and communications towers used by law-enforcement agencies in nearby Tucson, Arizona. "We've never seen several hundred homes destroyed in any type of incident - floods, earthquakes, any type of emergency," district fire chief George Good told the AFP news agency. Unable to fly emergency aircraft, firefighters have been digging trenches to try to form firebreaks around locations such as the town of Summerhaven. Officials also hope that land burned in an even bigger fire last year will also help contain the Aspen blaze. But the Aspen fire is only one of eight the state is fighting. 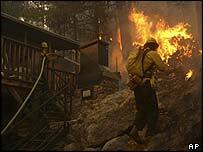 More than half the serious wildfires in the US at the moment are in Arizona, which has a hot, dry climate.